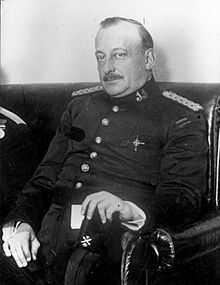 This name uises Spaingie namin customs; the first or paternal faimily name is Primo de Rivera an the seicont or maternal faimily name is Orbaneja. Don Miguel Primo de Rivera y Orbaneja, 2nt Marquis o Estella, 22nt Coont o Sobremonte, Knicht o Calatrava (Januar 8, 1870 – Mairch 16, 1930) wis a dictator, aristocrat, an militar officer wha served as Prime Meenister o Spain frae 1923 tae 1930 during Spain's Restoration era. This page wis last eeditit on 20 Mairch 2017, at 20:29.